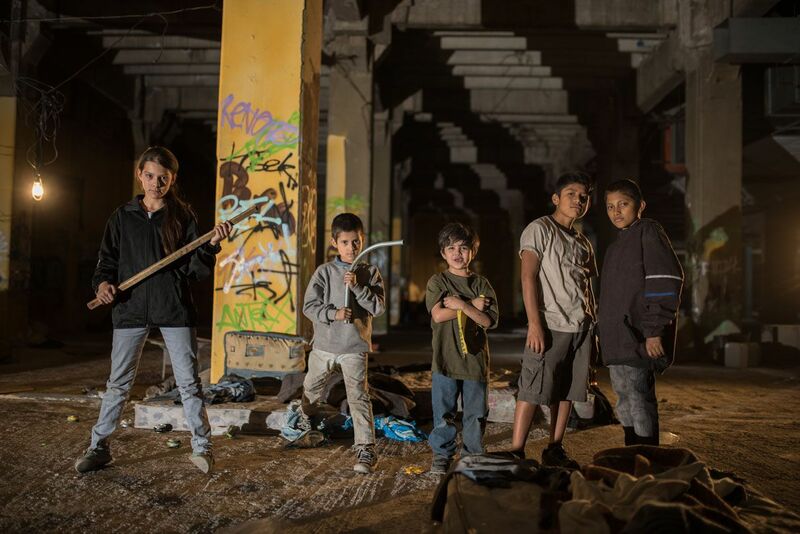 The Mexican film Tigers Are Not Afraid combines gritty reality with horror/fantasy in a way that recalls Guillermo del Toro’s superb films The Devil’s Playground and Pan’s Labyrinth. At the same time, writer/director Issa Lopez forges her own path, creating a dark fairy tale that oozes imagination while also showing deep empathy for the story’s young characters. The film, which has been making a splash on the festival circuit, screened at Fantasia 2018. Paola Lara plays 11-year-old Estrella. Her mother has disappeared, presumably falling prey to the violence of the local drug cartels. Abandoned and lonely, she falls in with a group of boys who are similarly living on the streets. One of them is in possession of a cell phone belonging to a cartel member. That guy and his cohorts come looking for it, causing the kids to become embroiled in a struggle to survive. The fantasy element in Tigers Are Not Afraid comes from the way Estrella clings to imagination as a means of dealing with the terrifying reality in front of her. She sees a line of blood that follows her around when something unpleasant is about to happen, there’s a stuffed tiger who provides her with an important clue, and a couple of times she views ghostly figures. Estrella also believes that she has been given three magical wishes. Over the course of the story, she uses them strategically. Those elements are used to underline the harsh experience she’s stuck in. Lopez wisely does nothing to water down the depiction of young Mexican children living on the streets. The film takes you deep inside that issue, showing how scary it is and how helpless these kids feel. To call the film a gut punch would be an understatement. The sole bright spot is that Estrella finds connection with the other children, most notably Shine (Juan Ramon Lopez). All in the same boat, they overcome initial mistrust, recognizing that their chances of survival increase when they band together. Watching how this happens is affecting. At 76 minutes (minus end credits), Tigers Are Not Afraid certainly had room to develop everything even further than it does. Then again, it’s not necessarily a bad thing when a movie is so good that it leaves you wanting more, right? The performances from the young actors are authentic, and the film spotlights a very real problem too many children are forced to deal with, in a manner that rattles you while still providing the entertainment value that comes from watching a skillfully-made work. For my reviews of movies in current release, please visit the main page of The Aisle Seat. For more information on Fantasia 2018, please visit the official website.